People enjoying Hahei beach. Mahurangi Island (L) and Te Karaka Island far right. 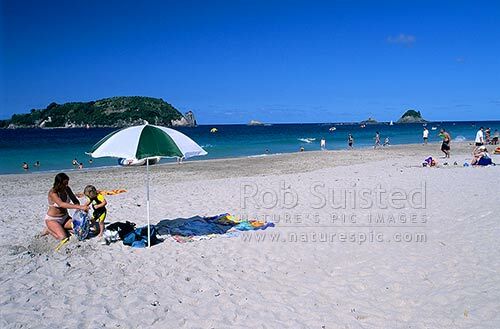 Woman and girl under beach umbrella in foreground, Coromandel Peninsula, Thames-Coromandel District, Waikato Region, New Zealand (NZ), stock photo.